A new technique to create long strands of DNA could make it more economical to assemble DNA nanostructures for applications such as smart drug-delivery systems, according to a research team led by McGill Chemistry professor Hanadi Sleiman. 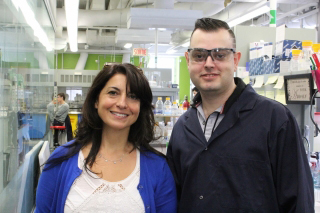 Prof. Hanadi Sleiman (left) and Janane Rahbani in their lab at McGill. Imagine taking strands of DNA – the material in our cells that determines how we look and function – and using it to build tiny structures that can deliver drugs to targets within the body or take electronic miniaturization to a whole new level. While it may still sound like science fiction to most of us, researchers have been piecing together and experimenting with DNA structures for decades. And, in recent years, work by scientists such as McGill chemistry professor Hanadi Sleiman has moved the use of man-made DNA structures closer to a variety of real-world applications. In new research published May 5 in Nature Communications, however, Sleiman’s team at McGill reports that it has devised a technique to create much longer strands of DNA, including custom-designed sequence patterns. What’s more, this approach also produces large amounts of these longer strands in just a few hours, making the process potentially more economical and commercially viable than existing techniques.